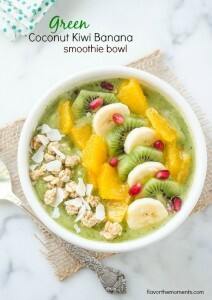 Green Coconut Kiwi Banana Smoothie Bowl is a refreshing mix of kiwi, spinach, banana, and coconut milk, topped with fruit, granola, and toasted coconut. It's healthy, delicious, and also vegan and dairy free! Serves: 2 large or 4 smaller servings, depending on the size of your bowl! Place the kiwi, spinach, banana, coconut milk, and 1 tablespoon of agave syrup in a blender. Place the lid on and pulse until smooth, turning off the power and scraping down the sides if necessary. If the smoothie is too thick for your preference, add more coconut milk. Taste the smoothie and add the additional tablespoon of agave syrup, if desired. Pour the smoothie into bowls, and arrange fruit decoratively over the top with the granola and coconut flakes, if using. Serve immediately, and enjoy! *The coconut milk may be substituted for your favorite milk, including cow's milk, almond milk, etc. I used light coconut milk, and the smoothie was plenty delicious! *I used 1 tablespoon of agave syrup and the smoothie was plenty sweet for my taste, but add the amount that you works for you. *The agave syrup may be substituted with maple syrup, honey, or sugar. *You can purchase toasted coconut flakes at Trader Joe's, or just toast them in a skillet on the stove top over medium low heat for about 3-5 minutes, stirring occasionally.